Due out on May 5 for $19.99. Bethesda Softworks and Machinegames have announced Wolfenstein: The Old Blood, a standalone prequel to last year’s Wolfenstein: The New Order. Due out digitally across PlayStation 4, Xbox One, and PC on May 5 (in Europe, the PlayStation 4 and PC versions will also be available at retail), the game will be $19.99 / £14.99 and you won’t need The New Order to play. 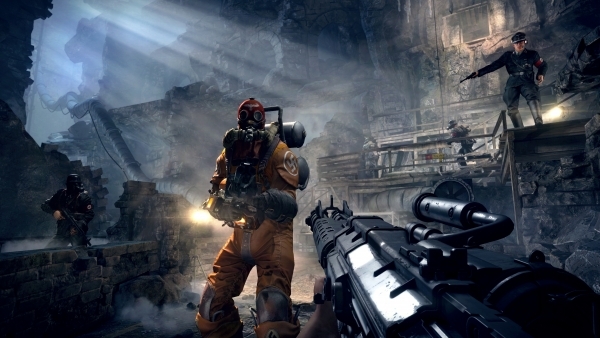 Part one of Wolfenstein: The Old Blood – Rudi Jäger and the Den of Wolves – pits BJ Blazkowicz against a maniacal prison warden as he breaks into Castle Wolfenstein in an attempt to steal the coordinates to General Deathshead’s compound. In part two – The Dark Secrets of Helga Von Schabbs – our hero’s search for the coordinates leads him to the city of Wulfburg where an obsessed Nazi archaeologist is exhuming mysterious artifacts that threaten to unleash a dark and ancient power. Watch the announcement trailer below. View the first screenshots at the gallery. Bethesda will live stream the first gameplay at PAX East this weekend on Twitch.